Clean and shape data to make it easier to combine with other data or to make it simpler for other people to understand. After you connect to the data that you want to include in your flow, begin cleaning and shaping your data by adding new steps to the flow. Hover over a step until the plus icon appears, and then click the icon to display options. Add Branch: Split your flow into different branches. Add Step or Insert Step: Add a step to a new flow or insert a step into an existing flow to perform cleaning operations. Add Aggregate: Select the step that includes the data you want to aggregate or group. Add Pivot: Select the step that includes the data you want to pivot. Add Join: Select the step that you want to join data with. 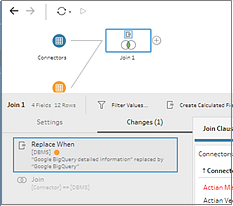 In Tableau Prep Builder version 2019.1.3 and later, if you connect to databases that include tables with relationship data you can also create a join from the menu in the Flow pane. For more information about joining tables using this method, see Use existing table relationships to join data. For more information about creating a join, see Join or Union Data. 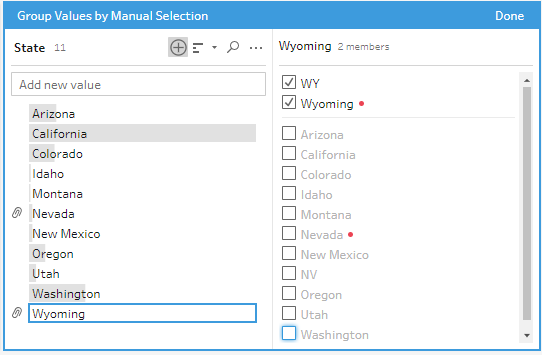 Add Union: Select the step that you want to union data with. As an alternative, you can drag and drop a step to union files. For more information about creating a union, see Join or Union Data. Add Output: Select this option to save the output to an extract file (.tde or .hyper), a .csv file, or publish the output as a data source to a server. Tableau Prep Builder assigns each step in your flow a color by default. This color scheme is applied throughout the flow to help you keep track of your data throughout the flow as you apply cleaning steps, join, union or aggregate the data so you know which files are impacted by your operations. Select one or more steps. Right-click on a selected step and select Edit Step Color. Click on a color in the color palette to apply it. Click Undo from the top menu. Select the steps you changed, right-click on a selected step and select Edit Step Color, then select Reset Step Color from the bottom of the color palette. As you build your flow and perform various cleaning operations, you might want to add a description to help others who might later look at or work with your flow to better understand your steps. You can add a description to any individual step in your flow directly on the Flow pane. The description can be up to 200 characters long. When you add a description, a message icon is added underneath the step. Click the icon to show or hide the description text in the Flow pane. In the Flow pane, select a step. Right-click the step and select Add Description from the menu. 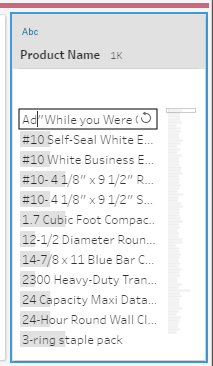 Double-click in the name field for the step, then click on Add a description. Type your description in the text box. Click outside the text box or press Enter to apply your changes. By default, the description displays underneath the step. To hide the description click the message icon. To edit or delete the description, right-click on the step or description then from the menu, select Edit Description or Delete Description. At any point in the flow, you can remove steps or the flow lines between steps. To remove a step or flow line, select the step or line you want to remove, right-click the element, and then select Remove. Press Ctrl+A (Cmd+A on Mac) to select all elements in the flow, or press Ctrl+click (Cmd+Click on Mac) to select specific elements, and then press the Delete key. Sometimes analyzing data from a spreadsheet or crosstab format can be difficult in Tableau. 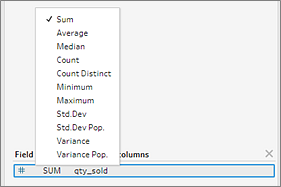 Tableau prefers data to be "tall" instead of "wide", which means that you often have to pivot your data from columns to rows so that Tableau can evaluate it properly. However you may also have scenarios where your data tables are tall and narrow and are too normalized to properly analyze. For example a sales department that tracks advertising spend in two columns, one called Advertising that contains rows for radio, television and print and one column for total spent. In this type of scenario, to analyze this data as separate measures you would need to pivot that row data to columns. But what about pivoting larger data sets or data that changes frequently over time? You can use a wildcard pattern match to search for fields that match the pattern and automatically pivot the data. 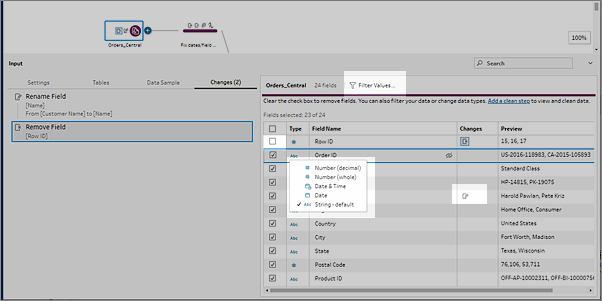 Use wildcard search to instantly pivot fields based on a pattern match (Tableau Prep Builder version 2019.1.1 and later). 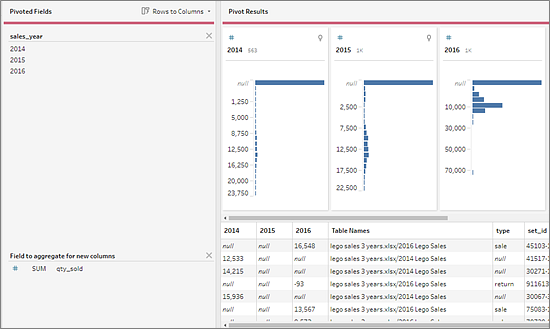 Pivot rows to columns (Tableau Prep Builder version 2019.1.1 and later). No matter how you pivot your fields, you can interact directly with the results and perform any additional cleaning operations to get your data looking just the way you want it. You can also use Tableau Prep Builder's smart default naming feature to automatically rename your pivoted fields and values. Use this pivot option to go from wide data to tall data. Pivot from columns to rows on one or more groups of fields. Select the fields that you want to work with and pivot the data from columns to rows. Drag the table that you want to pivot to the Flow pane. Click the plus icon, and select Add Pivot from the context menu. (Optional) In the Fields pane, enter a value in the Search field to search the field list for fields to pivot. 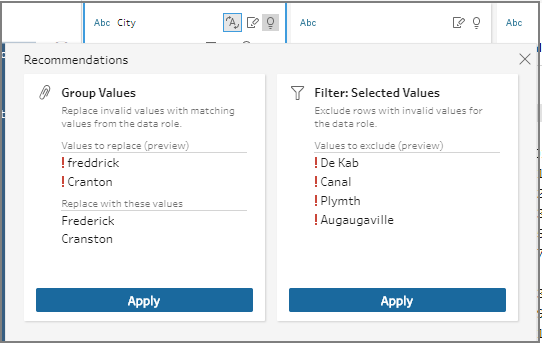 (Optional) Select the Automatically rename pivoted fields and values check box to enable Tableau Prep to rename the new pivoted fields using common values in the data. If no common values are found, the default name is used. Select one or more fields from the left pane, and drag them to the Pivot1 Values column in the Pivoted Fields pane. (Optional) In the Pivoted Fields pane, click the plus icon to add more columns to pivot on, then repeat the previous step to select more fields to pivot. Your results appear immediately in both the Pivot Results pane and the data grid. Note: You must select the same number of fields that you selected in Step 5. For example if you selected 3 fields to initially pivot on, then each subsequent column that you pivot on must also contain 3 fields. If you didn't enable the default naming option or if Tableau Prep couldn't automatically detect a name, edit the names of the fields. You can also edit the names of the original fields in this pane to best describe the data. (Optional) Rename the new Pivot step to keep track of your changes. For example "Pivot months". To refresh your pivot data when data changes, run your flow. If new fields are added to your data source that need to be added to the pivot, manually add them to the pivot. This example shows a spreadsheet for pharmaceutical sales, taxes and totals by month and year. By pivoting the data you can create rows for each month and year and individual columns for sales, taxes and totals so that Tableau can more easily interpret this data for analysis. Watch "pivot on multiple field" in action. 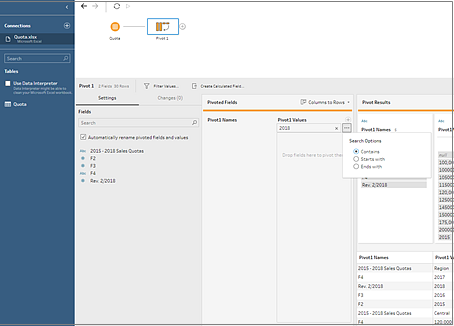 In Tableau Prep Builder version 2019.1.1 and later if you work with large data sets or if your data frequently changes over time, you can use a wildcard search when pivoting columns to rows to instantly pivot your data based on a wildcard pattern match. If new fields are added or removed that match the pattern, Tableau Prep Builder detects the schema change when the flow is run and the pivot results are automatically updated. In the Pivoted Fields pane, click on the link Click here to create wildcard pivot. Enter a value or partial value that you want to search for. For example, enter Sales_ to match fields that are labeled as sales_2017, sales_2018 and sales_2019. Do not use asterisks to match the pattern unless they are part of the field value that you are searching for. Instead click the Search Options button to select how you want to match the value. Then press Enter to apply the search and pivot the matching values. 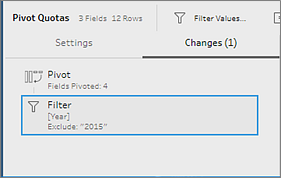 (Optional) In the Pivoted Fields pane, click the plus icon to add more columns to pivot on, then repeat the previous step to select more fields to pivot. 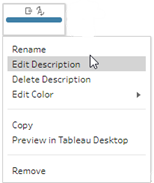 If you didn't enable the default naming option or if Tableau Prep Builder couldn't automatically detect a name, edit the names of the fields. To refresh your pivot data when data changes, run your flow. Any new fields added to your data source that match the wildcard pattern are automatically detected and added to the pivot. Enter a different value pattern in the Search field and press enter. The pivot will automatically refresh and show the new results. Manually drag additional fields to the Pivot1 Values column in the Pivoted Fields pane. You can also remove fields that were added manually by dragging them off the Pivot1 Values column and dropping them in the Fields pane. Note: Fields that were added from the wildcard search results can't be removed by dragging them off the Pivot1 Values column. Instead try using a more specific pattern to match the search results you are looking for. 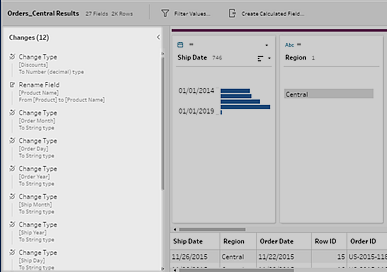 In Tableau Prep Builder version 2019.1.1 you can pivot rows to columns. Use this option if your data is too normalized and you need to create new columns - going from tall data to wider data. For example if you have advertising costs for each month that includes all advertising types in one column, if you pivot the data from rows to columns you can then have a separate column for each advertising type instead, making the data easier to analyze. You can select one field to pivot on. The field values for that field are then used to create the new columns. Then, select a field to use to populate the new columns. These field values are aggregated and you can select the type of aggregation to apply. Because aggregation is applied, pivoting columns back to rows won't reverse this pivot action. To reverse a row to column pivot type, you will need to undo the action. Either click the Undo button on the top menu, remove the fields from the Pivoted Fields pane or delete the pivot step. 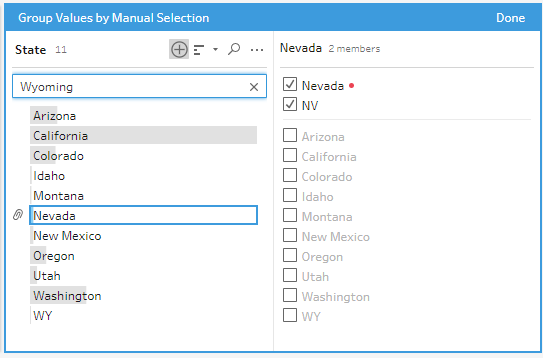 In the Pivoted Fields pane, select Rows to Columns from the drop-down list. Select a field from the left pane, and drag it to the Field that will pivot rows to columns section in the Pivoted Fields pane. Note: If the field you want to pivot on has a data type of date or datetime, you will need to change the data type to string to pivot it. The values in this field will be used to create and name the new columns. You can change the column names in the Pivot Results pane later. Select a field from the left pane and drag it to the Field to aggregate for new columns section in the Pivoted Fields pane. The values in this field are used to populate the new columns created from the previous step. A default aggregation type is assigned to the field. Click the aggregation type to change it. In the Pivot Results pane, review the results and apply any cleaning operations to the new columns that you created. If the field being pivoted has a change in its row data, right-click or Command-click (Mac) on the Pivot step in the flow pane and select Refresh. You clean data by applying cleaning operations such as filtering, adding, renaming, splitting, grouping, or removing fields. In prior releases, cleaning operations could only be performed in the Clean step type. In Tableau Prep Builder version 2018.2.1 and later, you could also perform cleaning operations in the data grid in a cleaning step. 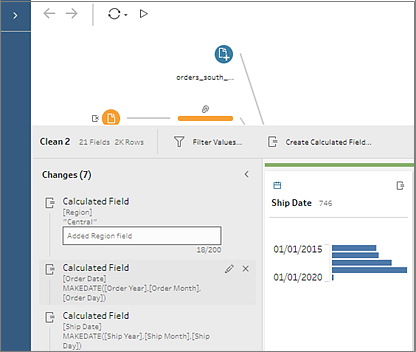 In Tableau Prep Builder version 2018.3.1 and later, you can perform cleaning operations in most step types in your flow. The one exception is the output step. Note: For Aggregation steps, the Clean menu options are only available for grouped fields. As you make changes to your data, annotations are added to the corresponding step in the Flow pane and an entry is added in the Changes pane to track your actions. If you make changes in the Input step, the annotation shows to the left of the step in the Flow pane and is also shown in the Input profile in the field list. The order that you apply your changes matters. Changes made in Aggregate, Pivot, Join and Union step types are performed either before or after those reshaping actions, depending on where the field is when you make the change. Where the change was made is shown in the Changes pane for the step. For example, if you change a field value in a join clause, the change is performed prior to the join action to give you the corrected results. The following table shows where the cleaning action is performed in Aggregate, Pivot, Join and Union step types depending on where the field is in the step. Note: For joins, if the field is a calculated field that was created using a field from one table, the change is applied before the join. If the field is created with fields from both tables, the change is applied after the join. Only some cleaning operations are available in an Input step. You can make any of the following changes in the Input field list. Your changes are tracked in the Changes pane and annotations are added to the left of the Input step in the Flow pane and in the Input field list. Filter: Click Filter Values in the toolbar then enter your filter criteria in the calculation editor. Rename Field: In the Field Name field, double-click (CTRL+click on Mac) on the field name and enter a new field name. Change Data Type: Click on the data type for the field and select a new data type from the menu. Remove Field: Clear the check box next to the fields that you don't want to include in your flow. All of the cleaning operations are available in the other step types. To apply cleaning operations to fields, use the toolbar options or click More options on the field profile card to open the menu. In Aggregate, Pivot, Join and Union step types, the More options menu is available on the profile cards in the Results pane. In a cleaning step you can also apply cleaning operations in the data grid. Just click the Hide profile pane button to collapse the Profile pane then click More options on a field to open the menu. Note: Not all cleaning operations are available in the data grid. For example if you want to edit a value in-line, you must do this in the Profile pane. In the Profile pane, data grid, or Results pane select the field you want to make changes to. Filter or Filter Values: You can also right-click (CTRL + Click on Mac) a field value to keep or exclude values. Group and Replace: Manually select values or use automatic grouping. You can also multi-select values in the Profile card and right-click (CTRL+click on Mac) to group or ungroup values or edit the group value. Clean: Select from a list of quick cleaning operations to apply to all values in the field. Split Values: Select either automatic or custom splits. 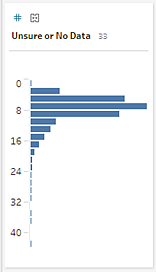 Note: Automatic split and custom split work the same as they do in Tableau Desktop. For more information, see Split a Field into Multiple Fields in the Tableau Desktop and Web Authoring Help. To edit a value, right-click (CTRL+click on Mac) one or more values and select Edit Value then enter a new value. 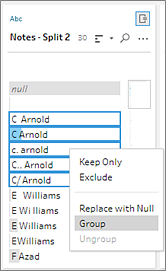 You can also select Replace with Null to replace the values with a Null value or double-click in a single field to edit it directly. For more information about editing field values see Cleaning (fixing) variations of the same value. Review the results of these operations in the Profile pane, Summary panes or data grid. The different types of cleaning operations are represented by icons over the steps in your flow. If more than four types of operations are applied to a step, an ellipsis displays over the step. Hover over these icons to view annotations showing applied operations and the order in which they are performed. 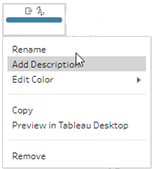 Starting in Tableau Prep Builder version 2019.1.3 and later, you can click on an annotation on the change icon on a step in the Flow pane or on a profile card in the Profile or Results pane and the change and field it impacts will be highlighted in the Changes pane and the Profile or Results pane. 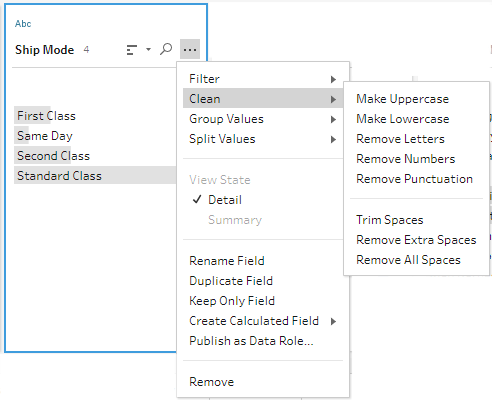 You can also select a step and then expand the Changes pane to view the details for each change, edit or remove your changes, drag changes up or down to change the order in which they're applied and in Tableau Prep Builder version 2019.1.1, you can add a description to provide context to other users. When viewing changes in an Aggregation, Pivot, Join, or Union step, the order that the change is applied shows either before or after the reshaping action. The order of these changes is applied by the system and cannot be changed. You can edit and remove the change. Select a step in the flow pane. Open the Changes pane or Changes tab. Right-click or Ctrl-click (Mac) on an entry in the Changes pane and select Add Description. Enter a description for the step. The description appears below the generated text for the change with a comment icon. To edit or delete the description, right-click or Ctrl-click (Mac) on the change item, and select Edit Description or Delete Description. Sometimes it can be hard to identify which cleaning operation you need to use to fix problems in your data. 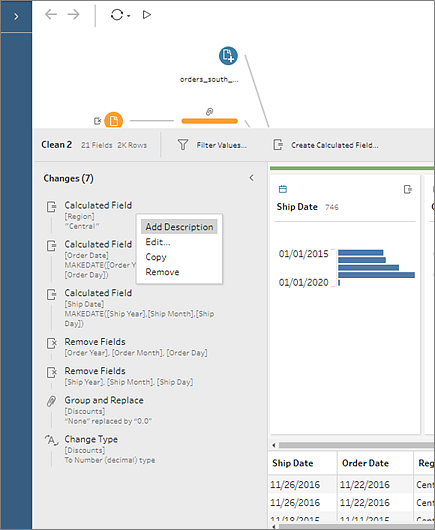 Tableau Prep Builder version 2018.3.2 and later has the ability to analyze your data and recommend cleaning operations that you can apply automatically to help you quickly fix problems in your data fields or help to identify problems so you can fix them. Note: If you don't want to use this feature, you can turn it off. From the top menu, go to Help > Settings and Performance. Then click on Enable Recommendations to clear the check mark next to the setting. Note: This option works specifically with data in fixed-width type text files. 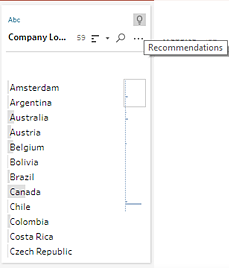 To use the split recommendation with this file type, after you connect to the data source, in the Input step, in the Text Settings tab, select a Field Separator character that is not used in the data so the data loads as a single field. Click the light bulb icon in the top right corner of the profile card. From the toolbar, click the Recommendations drop-down arrow to view all recommendations for your data set and select a recommendation from the list. This option only appears when recommended changes are identified by Tableau Prep Builder. To apply the recommendation, hover on the Recommendations card and then click Apply. The change is automatically applied and an entry is added to the Changes pane. To remove the change, click Undo in the top menu or hover over the change in the Changes pane and click the X to remove it. If Tableau Prep Builder identifies further recommendations as a result of the change, the light bulb icon remains on the Profile card until no further recommendations are found. 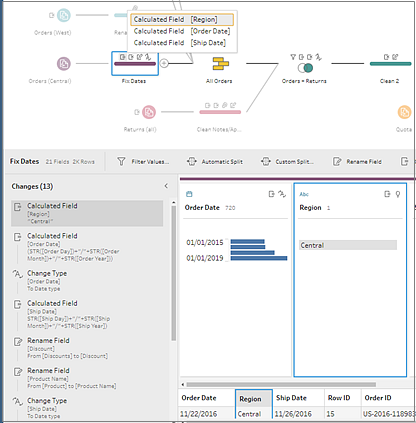 Repeat the steps above to apply any additional changes or ignore the suggested change and use the other cleaning tools in Tableau Prep Builder to address the data problems. If you have fields that contain the same values but are named differently, you can easily merge them into a single field to combine them by dragging one field on top of the other. When you merge the fields, the target field becomes the primary field and the field name of the target field persists. The field that you merge to the target field is removed. When you merge fields, Tableau Prep Builder keeps all of the fields from the target field and replaces any nulls in that field with values from the source fields that you merge with the target field. The source fields are removed. Drag and drop one field onto another. A Drop to merge fields indicator displays. Select multiple fields and right-click within the selection to open the context menu, and then click Merge Fields. Select multiple fields, and then click Merge Fields on the toolbar. For information about how to fix mismatched fields as a result of a union, see Fix fields that don’t match. Multiple variations of the same value can prevent you from accurately summarizing your data. You can quickly and easily correct these variations using the following options in Tableau Prep Builder. Note: Any edits that you make to the values must be compatible with the field data type. In the Profile card, click the value you want to edit, and enter the new value. A group icon shows next to the value. Alternatively, right-click a value and click Edit Value. The change is recorded in the Changes pane on the left side of the screen. View the results in the Profile pane, and data grid. You have several options to edit multiple values at once. For example, use quick cleaning operations to remove punctuation for all values in a field, manually group values using multi-select, automatically group values together using fuzzy-match algorithms that find similar values or select multiple values and replace them with Null. Note: When you map multiple values to a single value, the original field shows a group icon next to the value, showing you which values are grouped together. This option applies only to text fields. In the Profile pane, Results pane or data grid, select the field you want to edit. Make Uppercase: Change all values to uppercase text. Make Lowercase: Change all values to lowercase text. Remove Letters: Remove all letters and leave only other characters. Remove Numbers: Remove all numbers and leave letters and other characters. Remove Punctuation: Remove all punctuation. Trim Spaces: Remove leading and trailing spaces. You can stack operations to apply multiple cleaning operations to the fields. For example first select Clean > Remove Numbers and then select Clean > Remove Punctuation to remove all numbers and punctuation from the field values. To undo your changes, click the Undo arrow at the top of the Flow pane, or remove the change from the change list. In the Profile card, select the field you want to edit. Press Ctrl or Shift+click or Command or Shift+click (on Mac), and select the values that you want to group. Right-click, and select Group from the context menu. The value in the selection that you right-click becomes the default name for the new group but you can edit this in-line. To edit the group name, select the grouped field and edit the value or right-click or Ctrl+click (Mac) on the grouped field and select Edit Value from the context menu. To ungroup the grouped field values, right-click on the grouped field and select Ungroup from the context menu. If you have data rows that you want to include in your analysis but you want to exclude certain field values you can change them to a Null value. Right-click or Ctrl+click (Mac), and select Repace with Null from the menu. The values are changed to Null and the group icon shows next to the value. Use Group and Replace to map the value of a field from one value to another or manually select multiple values to group them. You can even add new values to set up mapping relationships to organize your data. For example, let’s say you have three values in a field: My Company, My Company Incorporated, and My Company Inc. All these values represent the same company, My Company. You can use Group and Replace to map the values My Company Incorporated and My Company Inc to My Company, so that all three values appear as My Company in the field. In the Profile pane or Results pane, select the field you want to edit. 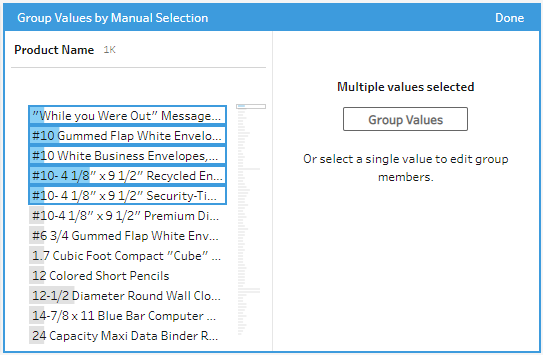 Click More options and select Group and Replace > Manual Selection from the menu. In the left pane of the Group and Replace editor, select the field value that you want to use as the grouping value. This value now shows at the top of the right pane. In the lower section of the right pane in the Group and Replace editor, select the values you want to add to the group. To remove values from the group, in the upper section of the right pane in the Group and Replace editor, clear the check box next to the values. In the left pane of the Group and Replace editor, select multiple values that you want to group. In the right pane of the Group and Replace editor, click Group Values. A new group is created using the last selected value as the group name. To edit the group name, select the grouped field and edit the value or right-click or Ctrl+click (Mac) on the grouped field and select Edit Value from the menu. To search for and automatically group similar values, use one of the fuzzy match algorithms. Field values are grouped under the value that appears most frequently. Review the grouped values and add or remove values in the group as needed. Pronunciation: Find and group values that sound alike. This option uses the Metaphone 3 algorithm that indexes words by their pronunciation and is most suitable for English words. This type of algorithm is used by many popular spell checkers. Common Characters: Find and group values that have letters or numbers in common. This option uses the ngram fingerprint algorithm that indexes words by their unique characters after removing punctuation, duplicates, and whitespace. This algorithm works for any supported language. For example, this algorithm would match names that are represented as "John Smith" and "Smith, John" because they both generate the key "hijmnost". Since this algorithm doesn't consider pronunciation, the value "Tom Jhinois" would have the same key "hijmnost" and would also be included in the group. 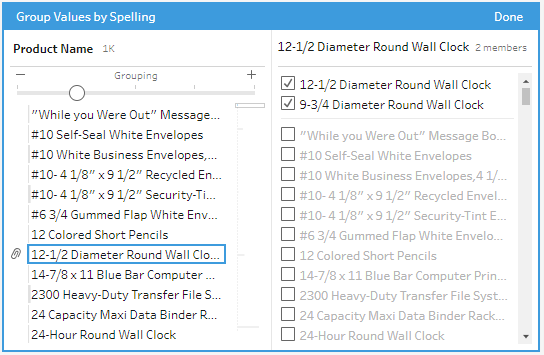 Spelling: Find and group text values that are spelled alike. This option uses the Levenshtein distance algorithm to compute an edit distance between two text values using a fixed default threshold. It then groups them together when the edit distance is less than the threshold value. This algorithm works for any supported language. 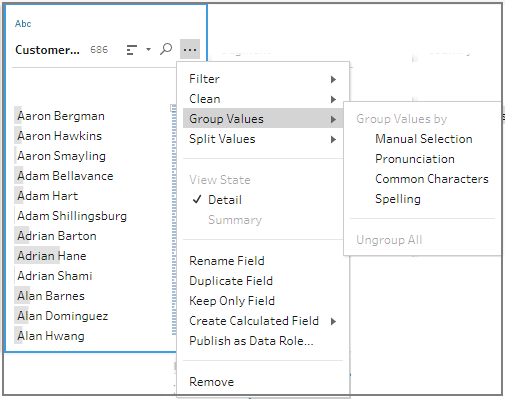 Data Role Matches: In Tableau Prep Builder version 2019.1.4 and later, if you assign a data role to your fields, you can use that data role to match and group values with the standard value defined by your data role. This new option then matches invalid values to the most similar valid value based on spelling and pronunciation. If the standard value isn't in your data set sample, Tableau Prep Builder adds it automatically and marks the value as not in the original data set. For more information see Group similar values by data role. Tableau Prep Builder finds and groups values that match and replaces them with the value that occurs most frequently in the group. 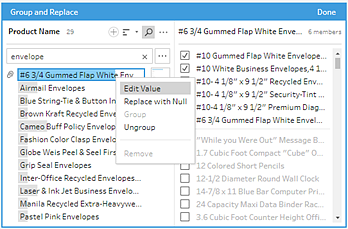 Review the groupings and manually add or remove values or edit them as needed. Then click Done. 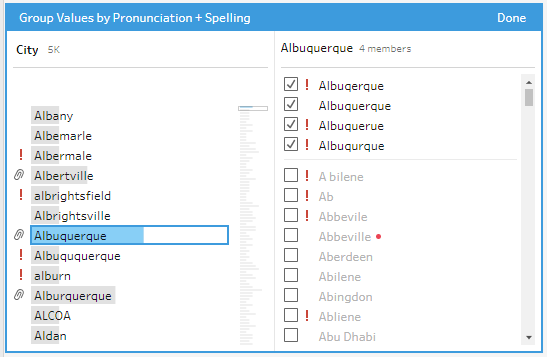 If you group similar values by Spelling or Pronunciation, you can change your results by using the slider on the field to adjust how strict the grouping parameters are. Depending on how you set the slider, you can have more control over the number of values included in a group and the number of groups that get created. By default, Tableau Prep Builder detects the optimal grouping setting and shows the slider in that position. 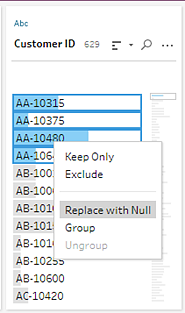 When you change the threshold, Tableau Prep Builder analyzes a sample of the values to determine the new grouping. 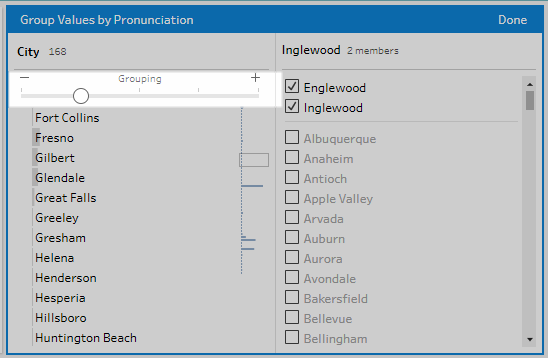 The groups generated from the setting are saved and recorded in the Changes pane, but the threshold setting isn't saved. The next time the Group and Replace editor is opened, either from editing your existing change or making a new change, the threshold slider is shown in the default position, enabling you to make any adjustments based on your current data set. In the left pane of the Group and Replace editor, drag the slider to one of the 5 threshold levels to change your results. To set a stricter threshold, move the slider to the left. This results in fewer matches and creates less groups. To set a looser threshold, move the slider to the right. This results in more matches and creates more groups. You can assign data roles to fields to help standardize your field values and quickly find values that aren't valid. 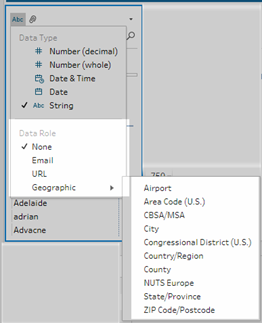 In Tableau Prep Builder version 2019.1.4 and later, if you assign a geographic data role to a field you can use the data role to group fields based on similar spelling or pronunciation and group the values under the standardized value defined by the data role. 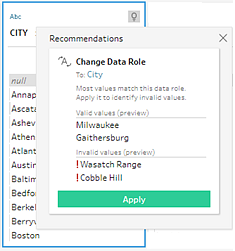 If the standard data role value isn't in your data set, Tableau Prep Builder adds it automatically and marks it as a value not in the data set. For more information about assigning data roles to fields, see Assign data roles to your data. Note: This feature is currently only supported for U.S.English. To use data roles to group values, complete the following steps. In the Profile pane, Results pane or data grid, click the data type for the field. Select one data role for the field. 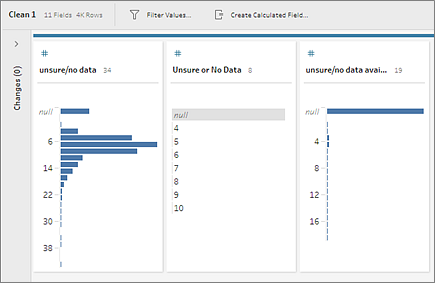 Tableau Prep Builder compares the field's data values to known domain values or patterns (for email or URL) for the data role you select and marks any values that don't match with a red exclamation point. Click More options , select Group and Replace then select Data Role Matches. 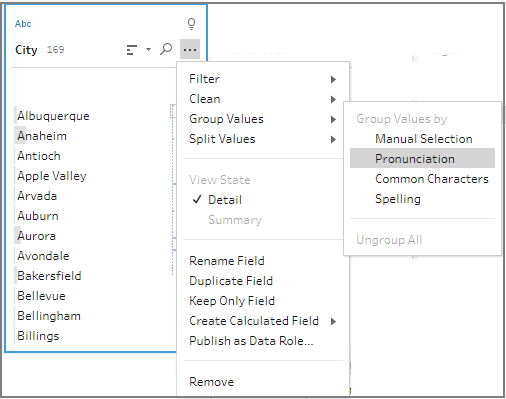 Tableau Prep Builder compares the values by spelling and pronunciation and then groups similar values under the standardized value for the data role. If the standardized value isn;t in your data set, the value is added and marked with a red dot. If you want to map values in your data set to a new value that doesn't exist, you can add it using Group and Replace. To easily identify any values that are not in the data set, these values are marked with a red dot next to the value name in the Group and Replace editor. 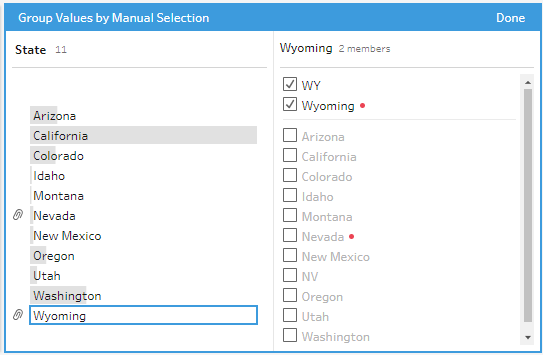 For example in the image below, Wyoming and Nevada aren’t in the data set. You just added the new value manually. The value is no longer in the data. The value is in the data, but isn’t in the sampled data set. 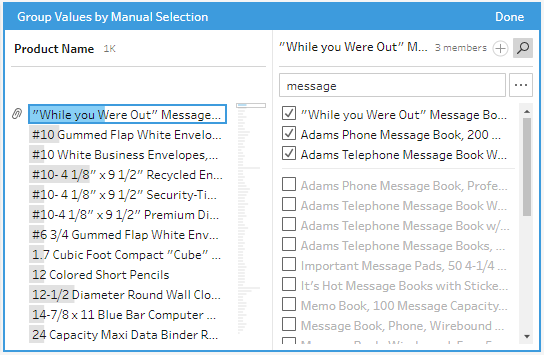 Click More options and select Group and Replace > Manual Selection from the context menu. In the left pane of the Group and Replace editor, click the plus to add a new value. Type a new value in the field and press Enter to add it. In the right pane, select the values that you want to map to the new value. (Optional) To add additional new values to your mapped value, click the plus button in the right pane in the Group and Replace editor. Sometimes you’ll need to adjust the granularity of some data, either to reduce the amount of data produced from the flow, or to align data with other data you might want to join or union together. For example, you might want to aggregate sales data by customer before joining a sales table with a customer table. If you need to adjust the granularity of your data, use the Add Aggregate option to create a step to aggregate or group data. Whether data is aggregated or grouped depends on the data type (string, number, or date). In the Flow pane, click the plus icon, and select Add Aggregate. A new aggregation step displays in the Flow pane and the Profile pane updates to show the aggregate and group profile. To group or aggregate fields, drag them from the left pane to one of the columns in the right pane. Drag and drop fields between the two panes. Search for fields in the list and select only the fields you want to include in your aggregation. Double-click a field to add it to the left or right pane. Change the function of the field to automatically add it to the appropriate pane. Click Add All or Remove All to bulk apply or remove fields. Apply cleaning operations to fields. Fields are distributed between the Grouped Fields and Aggregated Fields columns based on their data type. Click the group or aggregation type (for example, AVG or SUM) headings to change the group or aggregation type. In the data grids below the aggregation and group profile, you can see a sample of the members of the group or aggregation. Any cleaning operations that are made to the fields are tracked in the Changes pane.